Very few people know how the phrase “green hand” sounds in Persian, while every adult and child actually know this word. This is how exactly the spinach means, and there is enough myths around it. Today we are going to find out what legends about the spinach are there, and which ones are actually true. It is amazing that spinach is neither a seasoning or a spice, but it is in fact a vegetable. The reason is its independence, as it can be eaten within a meal or separately. Spinach is a Medieval food. In this age the green guest came to the Old World. It is considered that spinach comes from Persia, but it is also known that it was famous across many Arab countries, where many scientific studies were made about its healthiness. This leaf vegetable grown in Europe in 14th century would have nothing in common with the one we have today. The spinach we know is cultivated only since 16th century, and it had begun by Catherine de Medici, who made this vegetable a trend – she ordered spinach to be served during each meal. 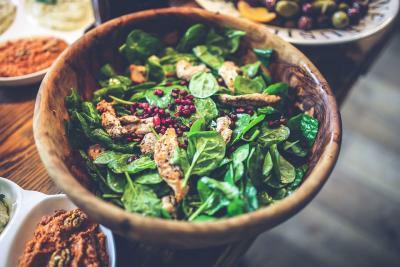 Nuts, berries, vegetables, cheeses, meat, soups… These are all just a part of the products that come good with spinach. It can serve as a nice light meal before the lunch, as well as a condiment for a sandwich which you can take to work. Legends and myths usually appear around the benefits of this plant. Unlike its older relatives which have carved their niches in the kitchen, spinach gets up to the pedestal of popularity and healthiness as well as falls down from it. Thus, since 20th century until 30s spinach was considered as containing uncannily high iron – 35 mg per 100 g of the product! The parents would be suggested to give spinach to the kids as a healthy, while every restaurant would offer two or three plates with spinach. However, it was discovered then that spinach is not that fantastic, and it’s 90% made of water. After this revelation, the consumption of spinach in Europe fell dramatically, and today it is mostly eaten in China. If you want to surprise your guests, add some spinach to your homemade pasta, and it will give it a special taste and a greenish color! To add some flavor to the plate, you can add some basil and serve it with tomato sauce. The Mediterranean cuisine is famous by its love for greens and cheeses. Making yourself feel like a Greek living near the seashore is easy – just add some spinach and basil to fresh cheese and put it all on a slightly toasted piece of bread. Recent studies show that spinach is really healthy. First, it is good for digestive system and pancreas. Rich in vitamins and minerals, it is well digested among others, so just a little portion is enough to make your body feel comfortable. Spinach pie is a perfect and fast option to cook. You can add a couple of hard-boiled eggs to the condiment.